FORT MYERS, Fla. – A WINK News Investigation uncovers a huge lawsuit about to go to trial in Lee County involving General Motors. The lawsuit accuses the company responsible for auditing GM’s finances of fraud, and it says GM’s Saturn division hid billions of dollars in losses from potential dealers right up until it took billions of dollars from U.S. taxpayers to stay afloat. One man who owned the three Saturn dealerships in Southwest Florida says that cost him $23 million, and he wants it back. In the beginning, Goodman’s relationship with Saturn and GM was a huge success. “Almost overnight we became number one in Florida. Number two in the Southeast region,” Goodman recalled. He bought or built three successful Saturn dealerships. One in Fort Myers, one in Naples and one in Cape Coral. The crown jewel of the three, a brand new, from the ground up, huge dealership in Cape Coral. He and his daughter put their hand prints in the concrete when the foundation was poured. According to Goodman, he had no way to know on that day they wouldn’t make it a year. “It was only open nine months when they announced it,” recalled Goodman. Nine months after the new dealership opened, GM announced that they were shutting down Saturn to cut losses. Goodman said the move made no sense to him. “When GM was pleading with the government for bailout loans, they said, ‘We’re going to consider killing Saturn because it’s lost a tremendous amount of money,’ so I kind of did one of those head shakes,” Goodman explained. His lawsuit alleges the financial statements he was given showing Saturn breaking even, which lead him to invest millions, were simply made up; complete fraud. 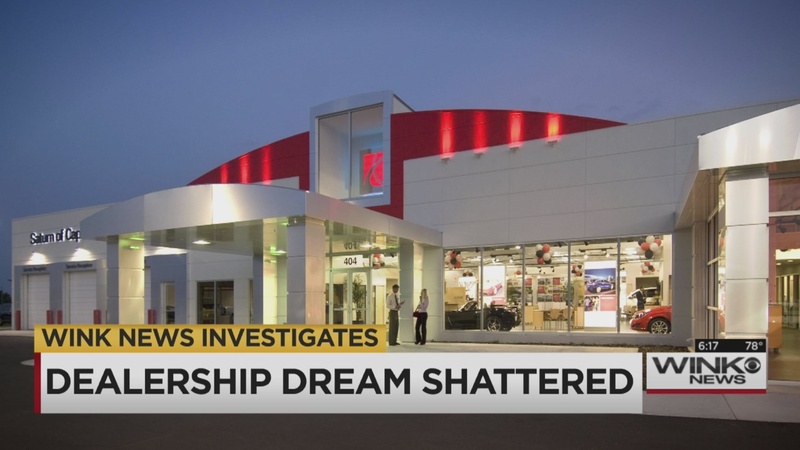 Goodman claims Saturn set up a “shell company” called SDC to paint a falsely positive financial picture to prospective dealers like him and keep billions of dollars in losses hidden. Goodman’s lawsuit is against Deloitte, the auditor. In court documents obtained by WINK News, Deloitte admits SDC had no employees, conducted no substantive business, and didn’t even own a computer system. “If someone had been told it’s losing a billion and a half dollars a year, no reasonable person would have said, ‘Okay, I’m going to plop down $7 million into a new building,’ ” said Goodman. We also uncovered this internal Deloitte memo admitting SDC was established by Saturn only as a means to show prospective dealers like Goodman financial reports. The memo also acknowledges that Saturn was actually losing billions. “If I go to the cardiologist and he doesn’t know what a heart is, he knows what it is and that it exists, but he really doesn’t know where it is or what it does, how can I expect him to perform a good exam that I can rely on?” remarked Goodman. Jill Lajek, who ran both Saturn and SDC, testified under oath that she had no idea whether or not Saturn really made or lost money. On the video you hear a lawyer ask, “So each year you had no idea Saturn financial corporations financial condition overall is that right? “She didn’t know about the billion and a half dollar loss. Never even thought about it. She was running the company and she says she never even thought about it,” questioned Goodman. The case is headed to trial here in Lee County in late June. The judge has already approved considering punitive damages above the $23 million Goodman has requested. Deloitte says it stands behind its audit and says it did disclose the relationship between SDC and Saturn.